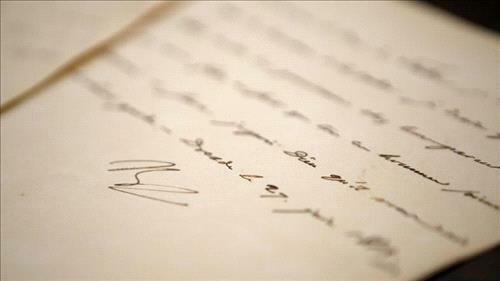 AMMONNEWS - Three love letters from Napoleon Bonaparte to his wife Josephine, written between 1796 and 1804, were sold for a total of 513,000 euros ($575,000) on Thursday, the Drouot auction house said. “No letter from you my adorable friend, you must have very sweet preoccupations since you forget your husband who, though in the midst of business and extremely tired thinks only and desires only you,” the French leader said in one letter written during the Italian campaign in 1796. The historically-themed auction run by the French Ader and Aguttes houses also included a rare Enigma encryption machine, used by Nazi Germany during World War II, which went for 48,100 euros. The items were part of a vast sell-off by the French state of the collection amassed by the collapsed investment firm Aristophil. It was shut down amid a scandal four years ago, taking 850 million euros ($1 billion) of its investors’ money with it. The previous 14 auctions, held last year, brought in 26.4 millions euros.